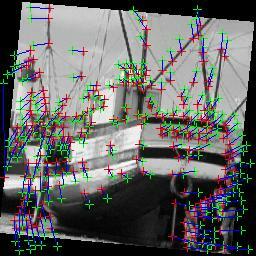 At this point I have the image registration algorithm complete, and it seems to be running well. Here are the images for some of the steps. Here is the first image and the interest points that were detected. Here is the second image points and the interest points that were detected. Here are the putative matches found by maximum correlation around interest points. These matches are then linked by a blue line and this line is plotted on the first image. After running RANSAC we get the inliers, or most consistent interest points under a single homography. These points are then plotted on the first image and linked with a line. After several rounds of optimization of the homography and finding new interest points matches based on the optimized homography we get a more accurate homograpy. 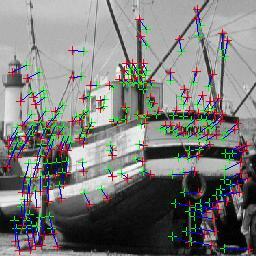 This is the second image with its interest points plotted in green and the matching interest points from the first image under the homography plotted over the second image in red. Finaly we have the first image under the found homography with it's original interest points plotted in green and it's transformed interest points plotted in red.